African King of R&B and EME boss Banky W has an amazing Valentine planned out for some lucky fans this week as he rolls out his Valentine’s Day giveaway in collaboration with MTECH communications. Three lucky fans will win a Samsung phone when they stream Banky W’s valentine playlist which consists of his greatest hits Strong Thing, High Notes, Made for You, Yes/No, Jasi and many more. Fans of the EME boss will also get a chance to call in and speak with him and also tweet him live on Valentine’s Day, as he will be spilling juice on his personal life and what he’s been up to, fans will also get to know what his plans are for Valentine’s Day. He will be live on air at the Beat 99.9 fm by 10 am on the 14thof February and later that day by 2pm he will be having a live twitter chat with fans on the Music Plus Tweet Guest. 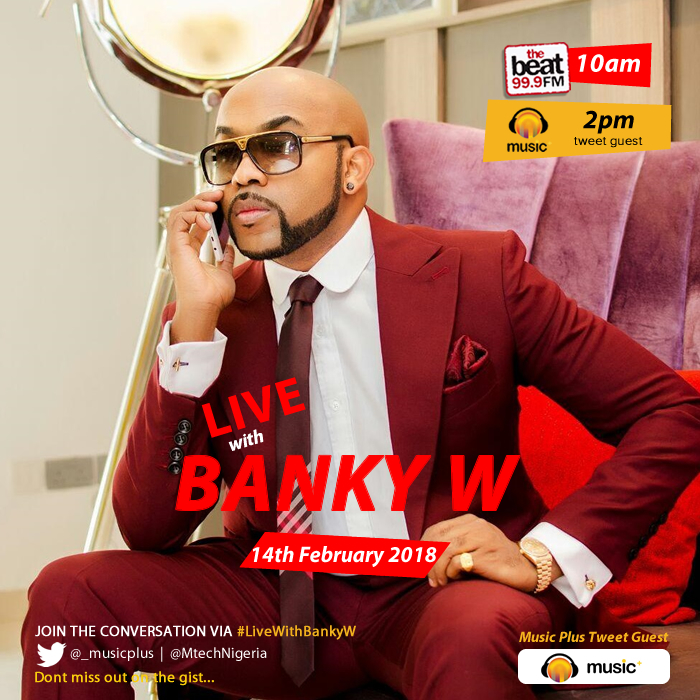 Fans should tune in and join the conversation with the hashtag #LiveWithBankyW and follow @_musicplus & @MtechNigeria so they don’t miss out on the gist. To qualify to win these amazing prizes fans can subscribe to stream Banky W’s Valentine playlist by texting 268 to 5900 (MTN Subscribers only), the top 3 streamers will be selected and they get to win a Samsung phone and recharge card vouchers, this promo ends on the 28th of February, 2018. Banky W who had a fairy tale wedding with the vivacious Nollywood actress Adesua Etomi last year, recently released a video to his hit single “Love you Baby”. 0 Response to "Banky W has loads of surprises for fans this Valentine Season"